"I also recommend that, in their catechetical training, and especially in their preparation for First Holy Communion, children be taught the meaning and the beauty of spending time with Jesus, and helped to cultivate a sense of awe before his presence in the Eucharist." Pope John Paul II speaks directly to children about the solemn importance of First Holy Communion in this excerpt from his "Letter to Children" written in 1994 during the "Year of the Family". Dear friends, There is no doubt that an unforgettable meeting with Jesus is First Holy Communion, a day to be remembered as one of life's most beautiful. 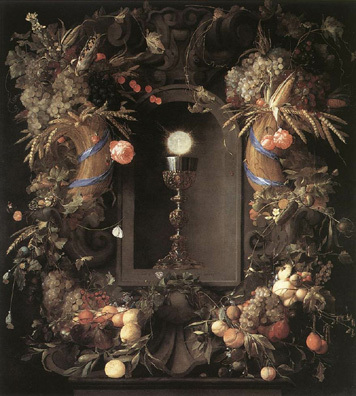 The Eucharist, instituted by Christ at the Last Supper on the night before His passion, is a sacrament of the New Covenant -- the greatest of the sacraments. In this sacrament, the Lord becomes food for the soul under the appearances of bread and wine. Children receive this sacrament solemnly a first time -- in First Holy Communion -- and are encouraged to receive it afterward as often as possible in order to remain in close friendship with Jesus. To be able to receive Holy Communion, as you know, it is necessary to have received baptism: this is the first of the sacraments and the one most necessary for salvation. Baptism is a great event! In the Church's first centuries, when baptism was received mostly by grownups, the ceremony ended with receiving the Eucharist, and was as solemn as first Holy Communion is today. Later on, when baptism began to be given mainly to newborn babies -- and this is the case of many of you, dear children, so that in fact you do not remember the day of your baptism -- the more solemn celebration was transferred to the moment of First Holy Communion. Every boy and every girl belonging to a Catholic family knows all about this custom: First Holy Communion is a great family celebration. On that day, together with the one who is making his or her First Holy Communion, the parents, brothers, sisters, relatives, godparents, and sometimes also the instructors and teachers, generally receive the Eucharist. The day of First Holy Communion is also a great day of celebration in the parish. I remember as though it were yesterday when, together with the other boys and girls of my own age, I received the Eucharist for the first time in the parish church of my town. This event is usually commemorated in a family photo, so that it will not be forgotten. Photos like these generally remain with a person all through his or her life. As time goes by, people take out these pictures and experience once more the emotions of those moments; they return to the purity and joy experienced in that meeting with Jesus, the one who out of love became the Redeemer of Man. For how many children in the history of the Church has the Eucharist been a source of spiritual strength, sometimes even heroic strength! How can we fail to be reminded, for example, of holy boys and girls who lived in the first centuries and are still known and venerated throughout the Church? Saint Agnes, who lived in Rome; Saint Agatha, who was martyred in Sicily; Saint Tarcisius, a boy who is rightly called the "martyr of the Eucharist" because he preferred to die rather than give up Jesus, whom he was carrying under the appearance of bread. Children must receive the Sacrament of Penance before they receive their First Communion, according to a letter sent to the world's bishops by the Vatican Congregations for the Sacraments and Divine Worship and for the Clergy. In the letter, dated March 31, 1977 but released May 19, 1977 the congregations say that in spite of a 1973 declaration on this matter, it is apparent that "dissension and doubts" still exist in some parts of the church regarding the order in which children are to receive these sacraments. Thus, they say, it is necessary to explain once again the "mind and force of this declaration," which states that the 1910 decree of Pope Pius X, "Quam Singulari," is the norm to be followed "everywhere and by all." Immediately below is the text of the letter. It is followed by a brief, formal reply to an inquiry from a religious institute -- one of many such inquiries and requests the congregations have received, the letter states. Even though the declaration Sanctus Pontifex was published on May 24, 1973, by both the Sacred Congregations for the Discipline of the Sacraments and for the Clergy (cf. AAS 65, 1973, 410), nonetheless, in some parts of the church and in some catechetical centers, dissension and doubts still remain about the ecclesiastical discipline which regards children's receiving the sacrament of penance before they receive their first communion. Many inquiries and requests have come to this apostolic see from bishops, from priests, and from parents. An apostolic religious institute which exercises its ministry in many countries posed the question explicitly whether, after the promulgation of the declaration, it was allowed, "as a general rule," to receive first communion without previous confession in those parishes in which this had become common practice. Moreover, recent information gathered by the Congregation of the Sacraments and Divine Worship have proved the need of inculcating the church's norms regarding these questions as well as the occasion for explaining once again, and thus answering a felt need, the mind and force of this declaration. This is done by giving an official reply to the question, which the religious institute had proposed (cf. appendix). It is certainly not necessary to explain the reason for publishing the decree since all realize what grave disturbance was created by some opinions based on psychological and pedagogical reasons, by which the traditional doctrine of the church was almost overturned. However, one must keep in mind that, while before the decree Quam Singulari (cf. AAS II Vol., p. 579), according to common opinion, children who reached a certain age could be admitted to confession, but not to receive communion, now on the other hand it is affirmed that children could go to communion, but that it is not fitting to make confession precede this sacrament. Already according to the decree, Quam Singulari, the origin of that regrettable custom was seen in not having defined the age of discretion for receiving the sacrament: "The abuses which we censure spring from this, that the age of discretion was not properly or correctly defined and that some assign one age for confession, and another for the eucharist." For this reason in n. I of the section of the decree that lays down dispositions, it is decreed that there is only one age for these sacraments and that when it is reached, the obligation begins of receiving both according to the designated order i.e., confession before communion. That confession should precede communion is clear from the order in which these two sacraments are named in the decree, as well as from the fact that the disapproved abuses regarded not the admission to confession but rather, admission to holy communion. The need for safeguarding and protecting worthy participation in the eucharist has compelled the church to introduce a norm in her discipline and pastoral practice that confession should precede communion and in this way the right of the faithful -- both of adults and children -- to receive the sacrament of reconciliation is recognized. Moreover, St. Paul's admonition (cf. I Cor. 11, 28) truly establishes a directing norm which regards even children. Therefore these also, before receiving the holy eucharist, should examine themselves. But often the child is not able to examine his conscience clearly and surely by himself. This will be done more easily and safely if he avails himself of the help of a priest confessor. In fact there are many children who feel troubled by small and unimportant things while there are others who ignore and pass over more serious faults. The precept of Canon 854 of the Code of Canon Law in which the judgment about the sufficient disposition for first communion belongs to the priest could not be observed if the child did not go to confession before communion. In this matter one must also keep in mind that many fine pastors have learned from their catechetical and ministerial experience the great usefulness and saving power which their first confession has in the life of children if it is carefully prepared, properly adapted to their age and their capacity to perceive spiritual things and carefully administered. When he arrives at the age of discretion, the child has the right in the church to receive both sacraments. It would be an absurd and unjust discrimination and a violation of his conscience if he were prepared for and admitted only to holy communion. It is not enough to say that children have the right to go to confession if this right remains practically ignored. When children are sufficiently instructed and are aware of the special nature of these two sacraments, it will not be difficult for them to go first to the sacrament of reconciliation which - in a simple but fundamental way -- arouses in them the awareness of moral good and evil and aids them to bring a more mature disposition to their happy meeting with Christ. The basic persuasion about the need of the greatest purity for receiving the eucharist worthily, if prudently instilled in children right from the time of their first communion, will accompany them for the rest of their lives and will lead to a greater esteem for, and a more frequent use of, the sacrament of reconciliation. The Roman Pontiff taught this in the letter he wrote through the Secretary of State on the occasion of the 26th Liturgical Week celebrated in Florence: "The Holy Father gives special consideration to the confession of children and, especially the first confession, which should always precede their first communion, even if they are fittingly separated by a period of time. For from that early age should begin the preaching of penance which offers a more fervent foundation later on for living faith both in receiving the sacrament as well as in giving proper direction to one's Christian life. " It can be observed that in many nations particular conditions of society and culture are not a legitimate reason for establishing a different discipline. Human nature is essentially the same everywhere and the goals of spiritual perfection, which belong to the sacrament, are proposed equally to everyone. And indeed, children in whatever circumstances of society and culture they live, if they can receive the eucharist in a conscious way suitable for their age, can also have an equal awareness of sin and ask God's pardon in confession. Finally, one must remember that the great renewal and greater vigor of the sacrament of penance, 'which is so necessary today and so desired by pastors in the universal church, cannot come about unless it has its foundation and principle in the careful and fruitful preparation and reception of the sacrament of Christian initiation. We are happy to take this occasion to profess ourselves with sentiments of esteem. To the doubt proposed: "Whether it is allowed after the declaration of May 24, 1973, to continue to have, as a general rule, the reception of first communion precede the reception of the sacrament of penance in those parishes in which this practice developed in the past few years." The Sacred Congregations for the Sacraments and Divine Worship and for the Clergy, with the approval of the Supreme Pontiff, reply: Negative and according to the mind of the declaration. The mind of the declaration is that one year after the promulgation of the same declaration, all experiments of receiving first communion without the sacrament of penance should cease so that the discipline of the church might be restored, in the spirit of the decree, Quam Singulari. To First Communicants  Pope Benedict XVI, On October 15, 2005 at the close of the Year of the Eucharist, Pope Benedict XVI spoke in St. Peter’s Square with several children who had received their First Holy Communion during the past year. Saturday. “Gestures and Postures of the Congregation at Mass”, which originally appeared in the February 2010 Adoremus Bulletin, is now available in PDF format, ,or go to google document, especially formatted for printing on standard 8.5 x 11 paper (2 sides). Permission is granted to reproduce this file for personal or parish use. For all other uses, please contact us.